Victories on the side of indigenous people in North America have been scarce since the colonization of the continent. After decades of struggle and only with the support of large conservation groups and commercial fishermen, there appears to be a victory for the tribes along the Klamath River, the Yurok, Hupa, and Kurak, coming in the form of the largest dam removal in history. However, it is difficult to tell whether the victory is for the indigenous people or if the fulfillment of their needs is merely a byproduct of more dominant concerns. The building of dams along the river began in 1908, and in the next 55 years, six dams were built at great detriment to the spiritual and cultural lives of the tribes along the river; these dams have produced conditions that have killed salmon and prohibit the upstream migration of salmon, an essential and sacred resource to tribal life (Sacred Lands Film Project). 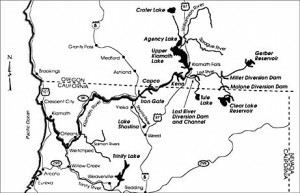 The Klamath Agreements, signed on February 18, 2010, combines the interests of “representatives of more than 50 organizations, including federal agencies, California and Oregon, Indian tribes, counties, irrigators and conservation and fishing groups,” and resolves to remove the dams. While restoring the river and the salmon run is an incredible triumph equivalent to restoring “a bloodline” to the Yurok, Hupa, and Kurak tribes the concern of the tribes, which had been known for many years, was only considered after huge ecological and economic issues (Peña). Had the access to salmon as a sacred resource been the only concern with the dams, it is unlikely that such a solution would have been reached. The 263-mile Klamath River, the second largest in California, is still one of the West Coast’s most important rivers for endangered populations, indigenous tribes, and commercial fishermen. Though only a shadow of its former self, the Klamath River used to be the third-largest producer of salmon on the West Coast,only following the Columbia and Sacramento rivers (Oregon Wild). The Hupa, Yurok, and Kurak tribes have resided beside the river for thousands of years. The dams built along the river began the limitation of the resource of salmon to the tribes; constructed with no consideration of the salmon movement, the dams ceased salmon migration at the Iron Gate dam, 190 miles upstream. As a result, “tribes above the dams were thus deprived of the ability to fish salmon altogether, while those further down the river switched to Fall Chinook, which were less prized but became more abundant because they were able to spawn below the dam” (Sacred Lands Film Project). These dams have been a serious detriment to the spiritual and cultural practices of the indigenous tribes along the river since they were built and have been ignored almost as long. The movement of indigenous populations reclaiming traditional and sacred lands is a global phenomenon that is vastly important to the survival of indigenous spirituality, culture, and tradition. In many traditions, land serves as a sacred space that is indispensible to religious belief and practice, in which “specific areas are regarded not only as abodes of gods but even as gods themselves” (Michaelsen 105). The restoration of the salmon run in the Klamath River is equally as significant, as the fish play a vital role in the economic, cultural, and spiritual identities of the indigenous people. Like the taking of a sacred site, the depletion of the salmon population in the Klamath River has been painful and crippling to the cultures that are integrated with the lives of the fish. 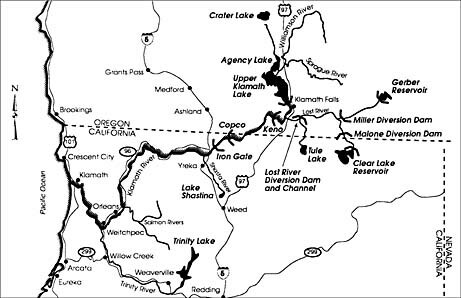 Unlike many unsuccessful attempts to reclaim sacred land, the issues and conflicts surrounding the dams on the Klamath River have “entangled tribes, farmers, fishermen, conservationists, government agencies and a big power corporation” and incorporates “economic well-being, cultural and spiritual traditions, and species survival” (Sacred Lands Film Project). Considering the lack of success for many other reclaiming projects by indigenous people, had the “cultural and spiritual traditions” been the only resource at stake in the Klamath River, the success of the movement would have been considerably less likely. The belief in salmon as a sacred resource is a dimension of the water issues of the Klamath River that would have probably continued to be ignored, as it had been for decades, had it remained a singular issue. In his 1877 report on the indigenous tribes of California, Stephen Powers spent much time discussing the importance of river and fishing culture to the Yurok, Hupa, and Kurak tribes. The imperative nature of this resource has been known since before the dams were built. In an interview with ABC News, Don Gentry, Vice-Chairman of the Klamath Tribes, said that the salmon “are a part of our life, they are a part of our lifestyle and our culture. It’s been unfortunate that we’ve been denied the salmon, the very resources that has been part of our history and culture, that’s in our legends” (Ashley). The Hupa “Legend of Gard” ensures that “the red-fleshed salmon shall never fail in the river” as long as the people practice the spirits’ teachings of love and people (Powers 80). In a Karuk creation legend that appears in Powers’ book, fishes were the first beings created “that have breath”, followed by other animals, and then man. In the beginning, the salmon did not swim up the Klamath, for the Creator had built a dam to protect the salmon, leaving the Karuk without enough food (ironically). As many died due to starvation, they Karuk befriended the coyote, who in turn stole the key to the dam and opened it. “Thus the salmon were allowed to go up the Klamath, and the Karok had plenty of food.” (Powers 37) The Hupa and the Karuk consider salmon to be a sacred resource that is earned, yet it has been unjustly denied to them due to industry and economics. In 1932, Helen R Roberts published an article explaining the extensive and critical First Salmon Ceremony of the Karuk tribe in the American Anthropologist Journal, a well know national journal. The importance of salmon is engrained in the culture of the tribes of the Klamath, and it has been known since 1877, yet it had no impact on the building of the dams until supported by larger interests. The damming of the river has caused more than spiritual and cultural problems for the indigenous populations, and it is these other problems that have created the power behind the solutions. 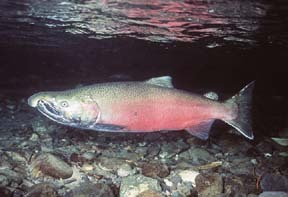 The defectively constructed dams have led to many ecological and conservation issues; poor water quality caused by low river levels, due in part to the overallotment of water to farmers, was to blame the largest fish kill in Northwest history, in which over 70,000 Chinook died before they could spawn in 2002 (Oregon Wild). Additionally, the dams “reduce the flow of water in the river, which raises the water temperature, depletes oxygen levels, and promotes the growth of parasites and toxic algae, especially in the still waters of the reservoirs behind the dams” (Sacred Lands Film Project). These conditions got the attention of conservation and commercial fishing groups, who have joined the debate over the dams. The steady decline in fish populations in the river has had devastating impacts on the fishing economy, which supports dam removal as a way to increase employment and improve profits. The inclusion of such a statement in a government report could indicate an understanding of and appreciation for indigenous people that has not occurred very often in the history of the United States had it not been included only after the “Fish and Fisheries and Recreation,” “Regional Economics and Jobs,” and “Water Quality and Sediment” sections of the report (Klamath Restoration.Gov). One has to ask the question, when did government agencies become so concerned with the wellbeing of indigenous tribe’s “traditional way of life”? At best, the concerns of the Klamath tribes were the proverbial straw that broke the camel’s back in order to cause some real change. At worst, the “Cultural Impacts” section was merely added as a means of appeasing a minority and keeping face. Either way, the success of this reclamation project could be used as a model for other indigenous peoples trying to reclaim sacred land. In order to succeed, get the attention energetic environmentalists and the support of the larger local economy, then, just maybe, the powers that be will hear your concerns. Ashley, Dan. “Settlement Reached to Remove Klamath Dams.” Abc7 News. American Broadcasting Company, 02 Nov. 2011. Web. 04 Nov. 2011. Bacher, Dan, Laurel Pena, and Regina Chichizola. “KLAMATH RIVER TRIBES Protest DAMS AT BERKSHIRE HATHAWAY MEETING.” News From Native California 21.1(2007): 8-11. EBSCOhost. Web. 04 Nov. 2011. “The Klamath River: Wild, Scenic, and Dammed.” Oregon Wild. Oregon Wild. Web. 4 Nov. 2011. Michaelsen, Robert S. “The Significance Of The American Indian Religious Freedom Act Of 1978.” Journal of the American Academy of Religion LII.1 (1984): 93-115. Print. Pena, Laurel. “Restoring Salmon Nation.” Earth Island Journal. Earth Island Institute, 1 Mar. 2007. Web. 4 Nov. 2011. Polidor, Amberly. “Klamath River.” Sacred Land Film Project. Earth Island Institute, 1 Aug. 2008. Web. 3 Nov. 2011. “Un-Dam the Klamath!” Klamath Riverkeeper. Klamath Riverkeeper, 2007. Web. 04 Nov. 2011.